The ingredients we used for our natural dye workshop were tumeric, coffee and blackberries. Some of the suggestions from Beth include tea, beets, red cabbage, berries and spinach. When using natural dyes, you must use natural fabrics. Beth chose 100% cotton flour sack cloths or tea towels as they're so versatile. Before you start the dye process, you need to create a fixative to help your fabric hold the dye color. As Beth shares, "When working with berries, use a salt fixative. Put 1/2 cup of salt in 8 cups of water. Place the fabric you want to dye in the mixture and boil for one hour. When working with vegetables, use a vinegar fixative. Mix one part vinegar and four parts water. Add your fabric and boil for one hour. When you remove the fabric, rinse in cold water." To make a natural dye, chop up or pour your ingredient into a pot with twice as much water as the ingredients themselves. Bring to a boil and let simmer for an hour. For deeper colors, you can leave the ingredients in the water (without heat) overnight. Then, dip your fabric in the dye. We wanted to color only part of the fabric, so Beth cleverly grabbed some string and we tied one end to the kitchen faucet and let what we wanted to dye, fall into the pot. You can play with this and find what works best for the design you wish to create. Beth and I both fell in love with this rich, caramel color from the coffee...but alas, the color faded about 50% after we rinsed the towel under water. To note, we only let this tea towel sit in the coffee for 45 minutes, however, so I'd try this for 24 hours and I bet the color will stick. The blackberries were really fun to work with and dyed our towels quickly (under 15 minutes). Berries are a strong, natural dye. Isa models her blackberry towel and her mama, Eileen shows off the tumeric dyed towel. And in actuality, tumeric was the easiest to work with, holding its vivid color the best out of our natural dyes. Just to add a little more fun to the workshop, Beth picked up some Kool-Aid packs and we tried tie dyeing a few shirts. The Kool-Aid dye does not need a fixative. 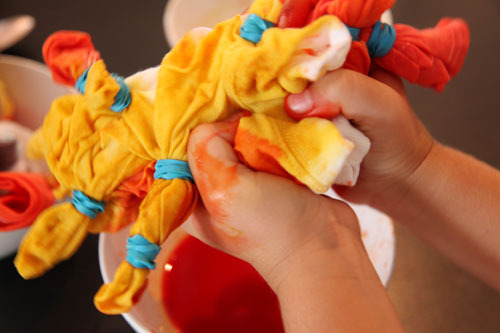 After your tie dye shirt is dry, take out the bands and set with a hot iron and press cloth. Take your time with this- if you don't get the shirt really hot from the heat, it won't set and the colors will fade quickly. ...which inspired Cora to do the same thing. There was a lot of female power energy in the room, ha! As Beth shares, "Using natural dyes is in itself an experiment." Half the fun is just coming up with new ideas on the fly- which new ingredients to try, for how long and what if I tried this, or that? In many ways, there are no rules. Just play and see what happens... it's good for the soul.